Never Shout Never are often championed as children of a bygone MySpace age which has since ultimately faded into oblivion. 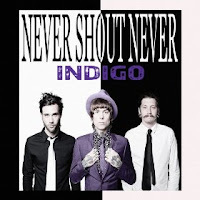 Where countless bands from that time have been and not just gone, but completely dropped off the faces of both physical and cyber worlds, Missouri’s Never Shout Never haven’t blinked off the radar for a second, and are back with their fourth studio album, "Indigo". Despite obstacles along the way, the secret to the three piece’s success is perhaps that their own brand of indie-pop (with a sprinkle of emo) is exactly that – their own brand. While comparisons can at times be drawn to other bands of the era, Never Shout Never pull off something quite special, and it’s more than true of their latest 11-track offering, featuring the same line up as 2011’s "Time Travel". Opening track ‘Magic’ is a little cheeky, yet highly contagious. Whilst it may not cast a spell, it casts the tone perfectly for other mischievous tracks on the record. With talk of one night stands and thousands of kisses, as in ‘Lust’, any other band might come across sleazy, but Never Shout Never manage an unimaginable style here that can’t help but be admired. ‘Wrong Side of Town’ continues the oxymoron as the band pull off certain vulnerability, even in the lyric’s less than innocent intentions. Throughout the record, there’s no doubt that frontman Christofer Drew is a storyteller, capturing his audience right up until the last resounding word like an author that keeps their readers hanging on until the end. In the vein of narrative songwriting, ‘The Look’ adds a theatrical element, with the lilt of the vocals displaying Drew’s consistently impressive range. With its bluesy feel and infectious beat, 'California Slang' will transport you to a place where you can literally imagine yourself dancing in some bar. Hell, you might get up and actually dance. With its tongue in cheek lyrics and its pining - but not whining - tone, it’s definitely one of the stand-out tracks of the album. As always with this band, there’s a kind of ethereal, almost spiritual edge to many of the tracks. In ‘Life Goes On’ the fast paced drum beat keeps focus while otherwise transporting the listener to faraway lands, while ‘All Mine’ juxtaposes bouncy strings and beats interspersed over almost dream-like melodies. Never Shout Never are clearly not without their quirks. The intro to ‘Sorry’ brings mystery, followed by the surprise of hitting us with the rest unexpectedly. With vocals suave and smooth, Drew sings with all the class of a Hollywood star of years gone by. There’s an almost wistful tone at times, lined with intrigue, all-important echoes in the breakdown and...an actual wolf howling. Despite the predictability of some of the lyrics, it’s enchanting enough to not need an apology, contrary to the title. Overall, this is a clear indication that the trio’s talent isn’t wavering in the slightest. With 11 tracks, each as individual as the one before it, it’s pretty easy to get lost in "Indigo". And after all, MySpace has made its more mature comeback; so long live its maturing music. "Indigo" will be released on November 13th through Loveway Records.